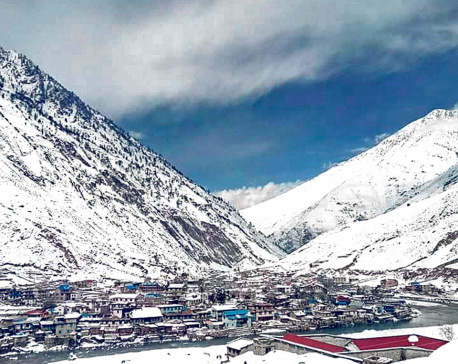 DOLPA, March 1; Dolpa witnessed the heaviest snowfall in decades as Tuesday night's incessant snowfall covered the district white. Locals have termed it the heaviest snowfall in decades. District headquarters in Dunai, and Tripurasundari were covered with four feet of snow. 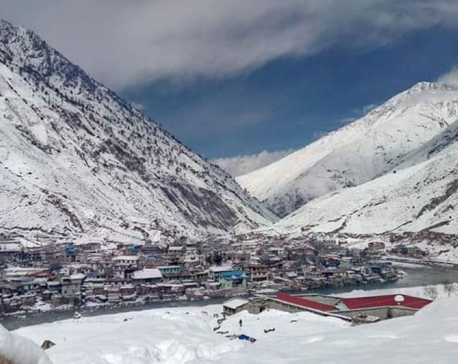 Villages in Upper Dolpa observed up to 6 feet of snow. Various wards of Thulibheri and Tripurasundari municipality along with the settlements in Jagdula and Mudakechula rural municipalities experienced up to 4 feet of snow. The snowfall left fruit farmers and cash-crop farmers extremely ecstatic with prospects of better produce because of the downpour. Farmers are hopeful of better produce this season because of the rain in early January and February. "It is after seven decades that we couldn't go out of home due to heavy snowfall in this area," said a local 74-year-old Rabi Prasad Neupane. According to him, the area that witnessed normal snowfall in the past saw four-feet snowfall this time. Snowfall however has disrupted air traffic in the district. Jufal Airport remained shut after Wednesday as five-feet snow covered the runway, said Bal Kumar Singh, chief of district civil aviation office. Travel to and from Dolpa to Jumla was also halted as incessant snowfall blocked border crossing points between the two districts. Additionally, landslide along the Jajarkot-Dolpa road section completely blocked passageway for vehicles. Government offices also remained dysfunctional after civil servants were unable to attend offices due to the adverse weather, said Assistant Chief District Officer Laxmi Sharma. As the temperature stooped below freezing point, cold chills left many unable to work. Others were stranded as snow blocked travel routes. Yaks that were left to graze in the forests in Upper Dolpa died as heavy blizzards and landslides hit areas along the high-Himalayas.